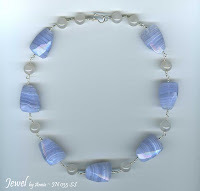 Blue Lace Agate and Rose Quartz gemstones. This simple and elegant necklace is handmade in 925 sterling silver components. Jewelry Designs - Start Shopping NOW! Making jewelry is my passion! I enjoy making and designing jewelry with various gemstones. I draw my inspiration from the array of colours, shape and sizes of the gemstones, and I tend to combine fantasy with the natural world. Jewel by Annie unique handmade jewelry designs are individually handcrafted with the finest materials. I use carefully selected natural semi-precious gemstones, beautiful freshwater pearls and sparkling Austrian Swarovski Crystals to create an array of exquisite jewelry. The jewelry pieces are mainly handcrafted in 14K gold-filled and 925 sterling silver components. I concentrate on designing limited jewelry pieces just so the wearer will feel confident and special. My greatest joy is to see my customers returning to model the jewelry pieces they bought from me! Be the first to know! Subscribe to Jewel by Annie Mailing list and get notify of new designs and promotion! This is a Flickr badge showing public photos from Jewel by Annie. Make your own badge here. Thank you for your interests and support in jewelry created from Jewel by Annie. At this point of time, I can only accept orders through email. Please send your orders to jewelbyannie@yahoo.com. For local orders, payment can be made to my account either through Internet Banking Fund Transfer options (provided by the local banks) or any ATMs' Fund Transfer options. The account number will be indicated on the email confirmation of your order. Only payment made in Singapore Dollars will be accepted for this method. Alternatively, you can opt for credit card payment via PayPal (see "International Orders" for more details). Please indicate your preference when ordering. For International Orders, payment can be made through Credit Cards via PayPal. Upon confirmation of your order, an email with a PayPal payment link will be sent to you. Click on the payment link and it will bring you to your order on a secure PayPal webpage. Please review your order and shipping charges before proceeding with the transaction. Payment made by credit cards via PayPal will be in Singapore Dollars. All items will be sent by registered standard mail once payment is cleared. All items will be sent by registered standard airmail once payment is cleared. If you prefer other postage methods, please indicate in your order email. I will check and let you know the postage cost.